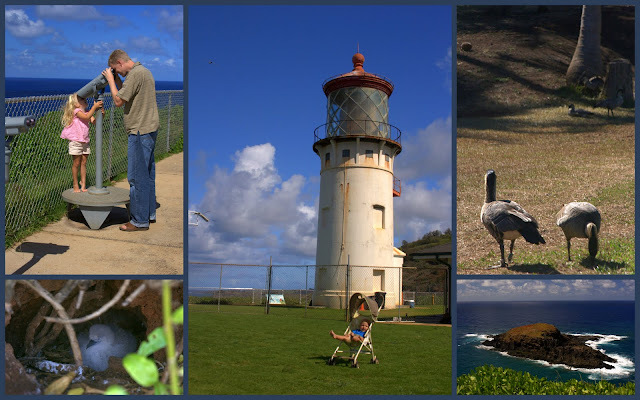 Last week we visited the Kilauea Lighthouse and bird refuge located on the northernmost tip of Kauai. Built in 1913, the lighthouse used to assist ships on the Orient run. Today it is a great place to see seabirds, monk seals and whales (in the winter). The bird refuge includes the small (five acres) Moku'ae'ae island across from the lighthouse. When the lighthouse was first built, the keeper would entertain friends and guests by swimming to the small island. Before heading back he would use a line to drop raw meat or fish half-way back to shore to attract sharks. He would wait for a temporary reprieve of shark activity and swim back home. He must certainly have been a thrill seeker - the distance between th two islands and the strong currents across the strait of water make it difficult enough for most people. While there we saw baby Ne-Ne or Hawaii Geese, the state bird of Hawaii and lots of red footed boobie birds.